The Cherryville Bathroom Vanity is the epitome of elegance in bathroom design. With its rich, warm Cherry finish and its multi-dimensional raised panel doors, the details and distinction offered in the Cherryville Collection is unrivaled. The Cherryville Vanity Series is perfect for traditional, transitional and formal bathroom styles. RTA Cabinets works on many home décor television shows, and the Cherryville Bathroom Vanity is our most often used design. The Cherryville Vanity Collection is right at home in any design that needs an elegant, rich cabinet. 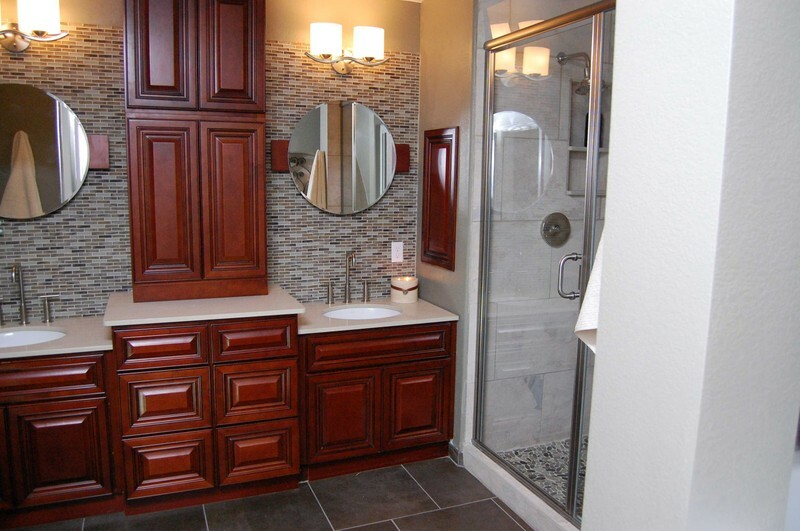 It is particularly handsome in traditional bathroom designs with modern touches. Because of the distinctive, warm finish, usually only found in hand carved Cherry wood in antique furniture, we love the more neutral palettes that let the cabinetry take front and center stage. The sleek gray that has become the ‘go-to’ neutral provides a handsome contrast, as well as colors of earth and nature. Granite and marble countertops are a natural for the Cherryville Vanity Series. Cultured marble in a creamy white seamless style lets the details and finish of the cabinetry really shine. A granite countertop, particularly our River White Granite with its maroon, gray and earthy veining, is a handsome look as well. The Cherryville Series can handle any number of fixture finishes for faucets, whether it is bright or aged brass for antique elegance, polished or satin nickel for a more modern twist, or rubbed or aged bronze to add depth. When it comes to flooring, larger floor tiles in porcelain, granite or marble offer a great look that doesn’t compete with the details of the Cherryville Vanities. Smaller wall tiles, particularly staggered subway tiles are a hit pick, and for more modern appeal, consider glass tiles for a sleek foil against the rich, warmth of the Cherry finish. •	Proper lighting in the bathroom gives the room a professionally designed feel, make sure to layer lighting with ambient (allover) lighting, decorative lighting, task lighting and accent lighting. 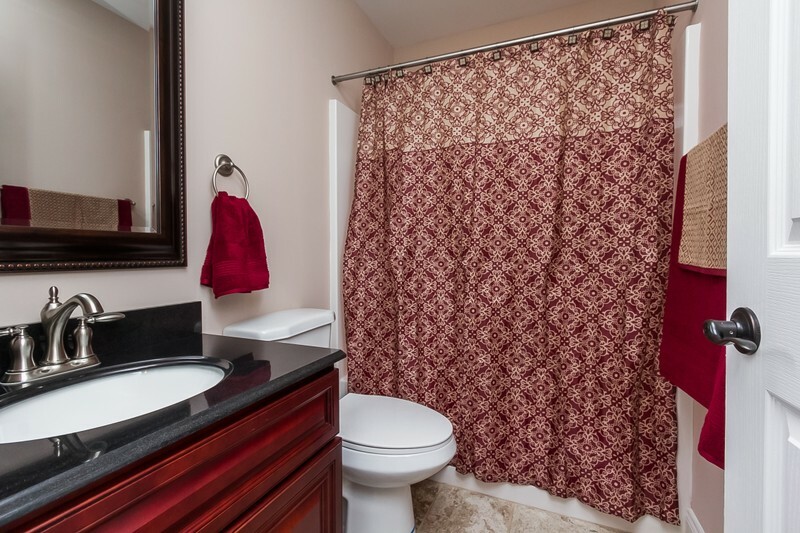 •	Go easy on the accessories in an elegant bathroom design, less can be more, and choose quality rather than quantity. The Cherryville Vanity Collection offers elegance and distinction, and its quality construction backs up its handsome good looks. The face frames, doors and drawer fronts are all solid wood, and there is no particle board used anywhere in their construction. Both the drawer glides and hinges are concealed. 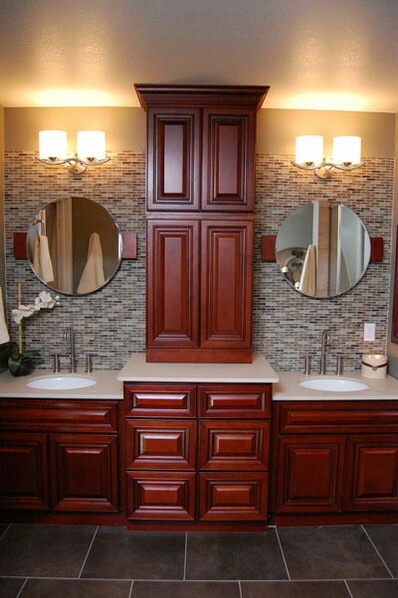 The Cherryville Bathroom Vanity Collection is 21 inches in depth. RTA Cabinets also makes a Cherryville Kitchen Cabinet Collection that can combine with the bathroom vanity to offer a variety of custom designed options. This allows the average homeowner to provide a professional look for a DIY project, and we’re happy to help! Our Cherryville Collection offers a distinctive elegance for your bathroom design, whether it is for a master bath retreat, guest bath or half bath. The timeless design of the cabinetry will allow it to grace your home for many years to come.